These Banana Chocolate Chip muffins are full of flavor, with much less fat than the traditional version. Perfect if you’re watching what you eat, but still crave delicious food! My workouts are still going strong! You may remember from instagram I made these muffins several months ago! It took so much willpower to hold off on sharing this recipe. It also took me several tries to get this recipe perfect. I didn’t want a dense, dry, low fat muffins. I wanted a muffin that was lower in calories and fat, but still sweet and delicious! My family LOVES muffins, and they of course expect sugary, delicious muffins from my kitchen. 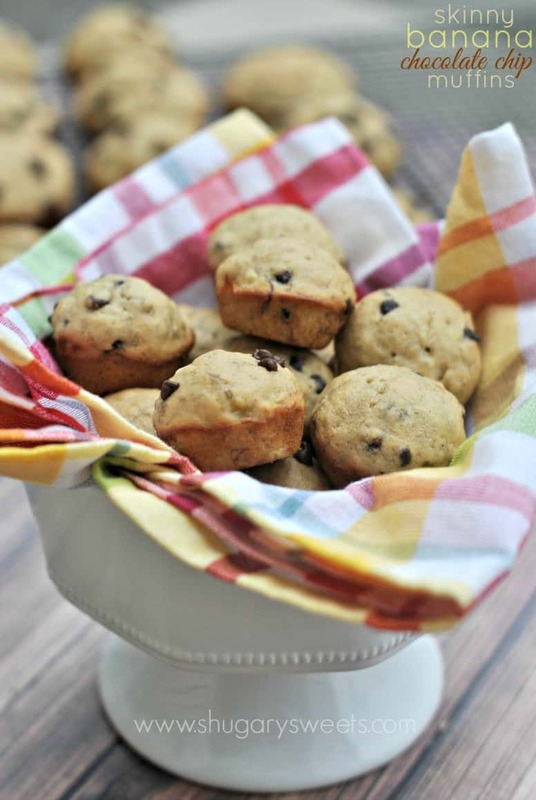 Can you believe no one complained when these healthier muffins were brought out for breakfast? They are so full of flavor and the texture is perfect. 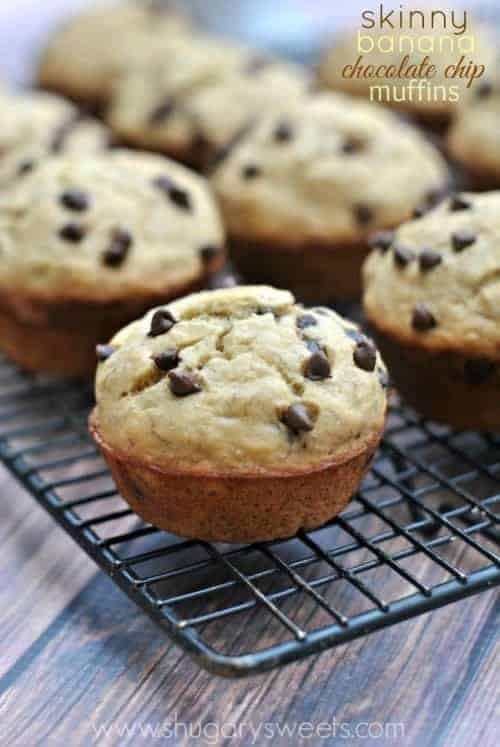 The extra chocolate chips are just the sweetness these muffins need, and the bananas give great texture and moisture to these muffins! I know I’ve said it before, but baked goods with my morning coffee are such a treat. I’m not one to enjoy eggs or oatmeal, I’ve tried. So instead, I’ll enjoy these no guilt muffins with my coffee! Who’s with me? I even made an extra batch of mini muffins. In case anyone asked! 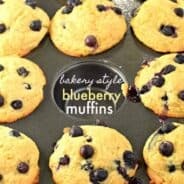 These muffins are great for the freezer too, if you want to work on portion control! In a large mixing bowl, beat honey, agave nectar, egg, vanilla and banana until blended. Add flours, baking powder, baking soda, salt, and yogurt. Beat for 1-2 minutes until fully combined. Fold in chocolate morsels. Grease cupcake tin with nonstick baking spray. Spoon batter into each tin (about 1/4 cup). Bake in a 350 degree F oven for 18-20 minutes. For mini muffins, bake 11-13 minutes. Remove and cool on wire rack. Store in an airtight container for up to 5 days or freeze for later use. ENJOY. For mini muffins, recipe makes about 36 muffins. 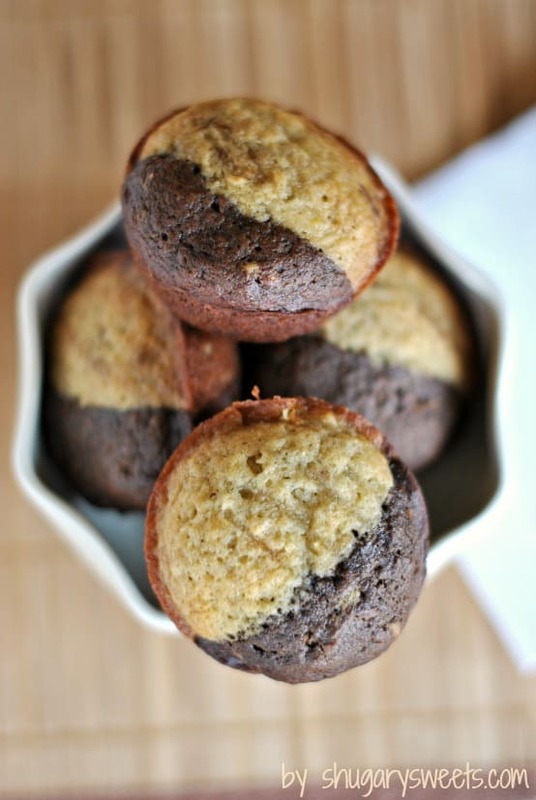 Chocolate Banana Muffins...easy and delicious, full of flavor! 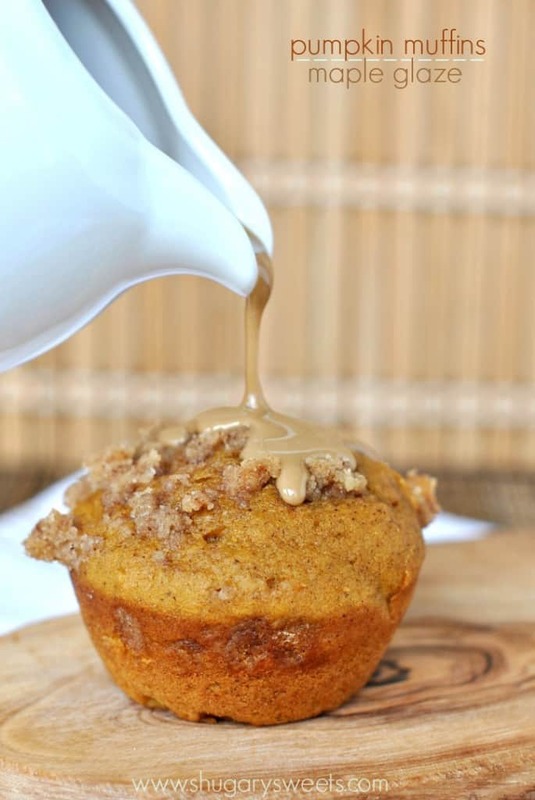 Pumpkin Muffins with Maple Glaze…these are so good, don’t forget the streusel on top! 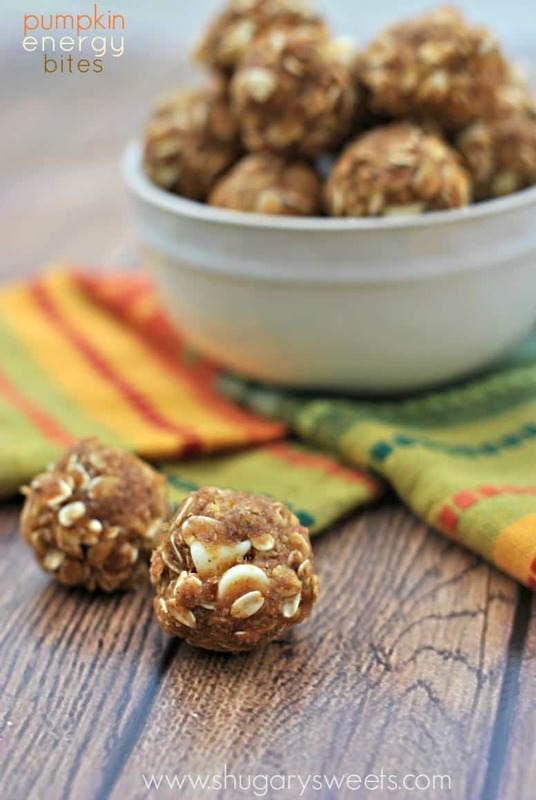 Speaking of pumpkin…don’t forget to give these Skinny Pumpkin Energy bites a try! Still looking for more muffin recipes? I’ve got you covered with my “Breakfast Table Goodies” Pinterest board! I wish I knew what agave nectar was, so I could try these! I’d love to trick the kids with something healthier. I’d have them at chocolate chips. Agave nectar is often used as a vegan replacement for honey. It is simply a sweetener, you can easily substitute it with an equal amount of honey or maple syrup. It’s a type of sweetener, I’ve seen it at Walmart before, and there are some tea shops that carry it as well. ooooh these are the perfect breakfast! Just enough of a treat, without the guilt! Those mini muffins are so cute! 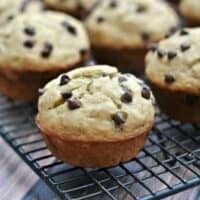 These muffins look amazing, with their domed tops and chocolate chips. I’ve been eating bananas like they are going out of style and these like the perfect way to eat them! Love these so much. Eating healthy in the New Year so this a great way to keep on track! These muffins look really good! I love the idea of honey. They look delicious! Love the sound of these muffins! Pinned! Can beat a skinny muffin! Looks great! You know how I feel about muffins and bananas…love that these are healthy!!! They sound awesome! I am a huge fan of chocolate in bread! I also love the idea of Greek yogurt in the mix to keep things moist! 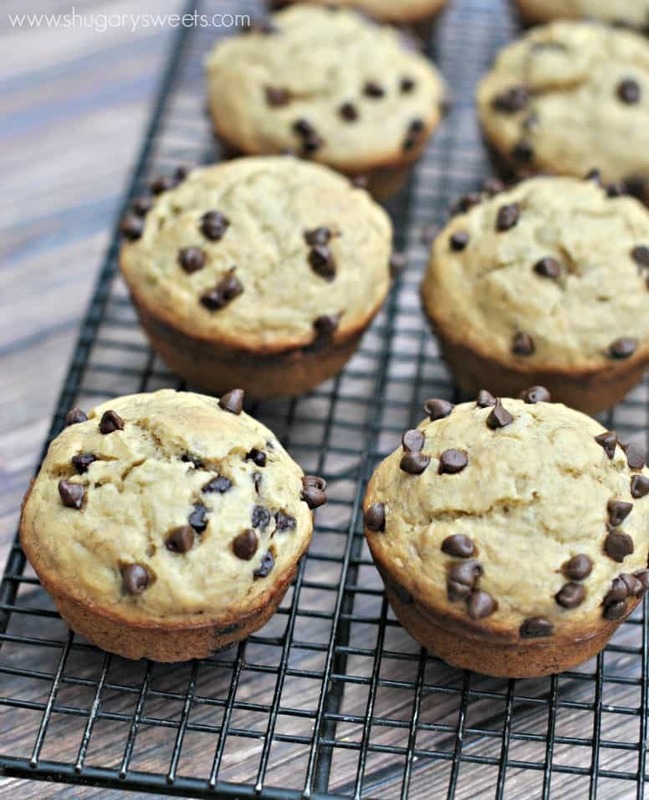 Aimee…I love your lightened up version of one of my favorite muffins….perfectly studded with those chocolate chips! I love baked goods for breakfast, too. And these would be a great way to start my day! These look great! I’m out of agave nectar. 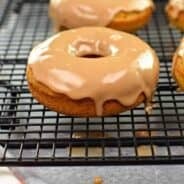 Would 1/4 cup plain sugar work just as well? I love a good chocolate chip muffin in the morning and really any time of day. It is a must to have a few healthy versions in your back pocket when you are trying to lighten thing up. I cannot wait to try this recipe. Yum! I bet these are delicious. I love that the only sweeteners are honey and agave. Can’t wait to give them a try! Can I get a calorie count for a regular size muffin? They are in the oven right now, they smell great! 🙂 Thanks for the recipe! These look amazing Amy. I am going to try them with maple syrup. My munchkin is sugar sensitive (honey too). Agave and brown rice syrup or maple syrup would be awesome. Wish me luck. They look so good. Definitely one of my favorite muffins! Soooooooo is it still healthy if I eat all the mini muffins in one sitting?? I would not complain having one of these muffins for breakfast with a cup of coffee. They sound so good and those mini chocolate chips make them so irresistible. Skinny or not – these look fab!! These look wonderful 🙂 I bet they taste just perfect! they sound like a great healthy breakfast! I adore skinny muffins! Great for breakfast or snacks and I love how well they freeze. These look wonderful! Skinny muffins?! Love them! I am so glad you can make basic recipes like this “skinny” and they taste just as delicious! 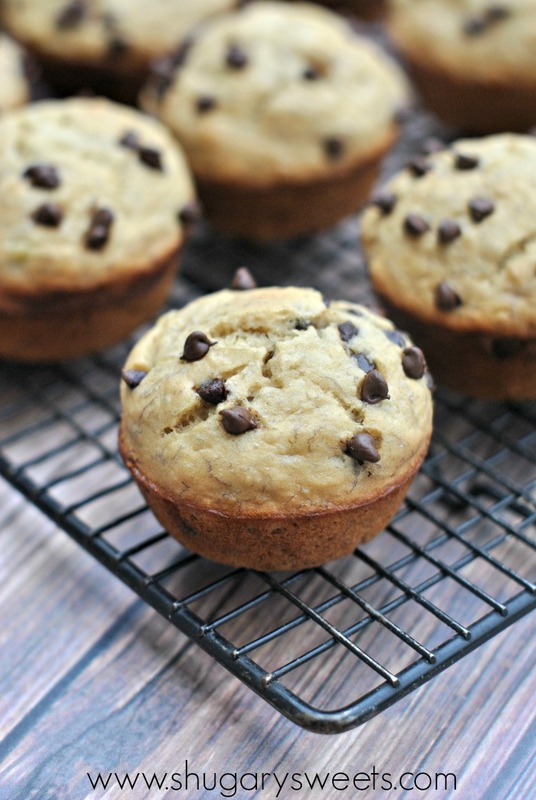 The chocolate chips make these banana muffins look so much more sinful than they actually are! Thanks girl!! It took several tries to get the texture right on these, but worth every fail!! 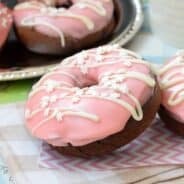 I dont have wheat flour, will almond flour work? or if i ground up flax seed? I don’t. But I know there are dozens of calculators on the web you can use. Thanks Aimee. No surprise- they were delicious! For anyone else who might be curious, I clocked these at 151 calories if you make 16 muffins or 134 cals if you make 18. Thanks again! Thanks for coming back and letting me know!! Pinned and have all the ingredients to make these. Only thing I didn’t have was Greek Yogurt. But wanted to pick up somefresh flowers and picked up the yogurt. Not a fan of any type of yogurt, the smell alone makes me run in the opposite direction. However, by the look of this recipe I just had to try making them. In the oven as we speak and we shall see. Sure the huibby will love them!!! I’ve been craving something banana and chocolatey, but something that wouldn’t make me feel bloated after (10?!) too many servings. I tried these out today and I am officially addicted!!! So moist and fluffy, with just the right amount of sweetness. Thanks so much for the recipe! I’m so glad you loved them Olivia!! Thanks for stopping back over and letting me know!! I was in such a hurry that I didn’t notice that it makes 18. So I have 12 big muffins. Just as well. I was satisfied with one, whereas with a smaller one I may have eaten two. Also they were done in 23 mins. This recipe is a keeper. I constantly look (in vain) at the comments section of internet recipes to see the ratings of the recipe, to see how they came out, cooking tips and suggestions and all I EVER find is a bunch of people saying how great they ” look” but nobody’s ever actually tried them. Hardly ever, at all. Can someone explain this phenomenon to me? It’s usually because bloggers have friends who share their recipes on social media. Then they comment to say “can’t wait to try this.” I love when people follow up with their actual thoughts, tips, tricks, etc about a recipe of mine!